Ice Waves Breaking On a Frozen Lake – Forcing Ice Fishers To Run To Safety!! As a result of warmer air blows across the lake and the ice begins to move in large sheets. The sheets of ice then hit the shore and immediately break up into shards and then become stacked on top of each other. 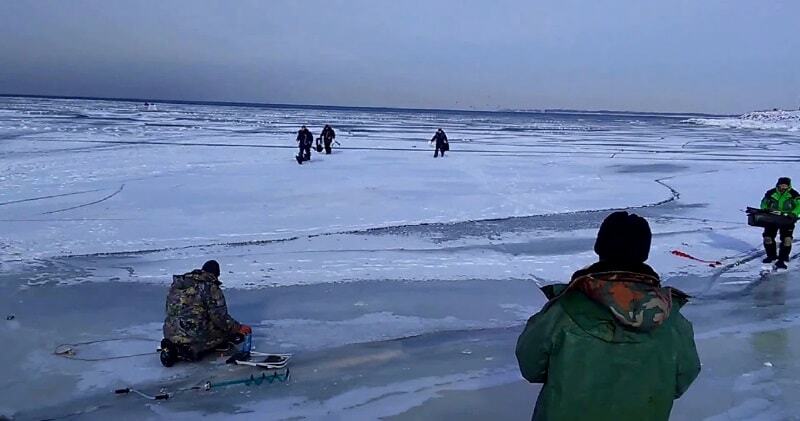 There were a slew of people out for the day ice fishing and all were forced to try and outrun the under ice wave and attempt to make it to the safety of the shore. A few people were caught between ice chunks and had to hop from one to the other in order to reach solid ground.The ice breaks into shards after it hits the shoreline and remarkably even appears to look like a genuine wave. Part of the lake seems to be frozen and camera footage shows the shards forming on the shore. The detailed footage clearly shows each shard breaking as it continues to move forward and up onto the beach.